July 18, 1994 marked one of the bloodiest, and most controversial, events in the history of the city of Buenos Aires. Argentina, which is home to more Jewish people than any other Latin American country, was shaken with tragedy when a van bomb containing about 275 kilograms of an ammonium nitrate and fuel oil mixture exploded beside the Jewish Community Center, the Argentine Israelite Mutual Association (AMIA). 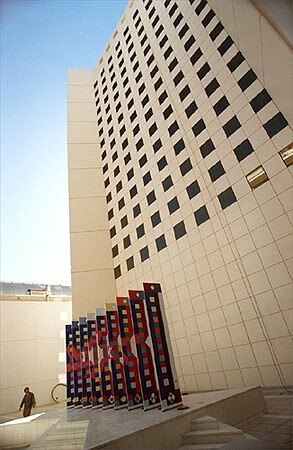 The explosion destroyed the side of the building, which caused each of the five floors to fail. The majority of the building would collapse in seconds, leading to massive destruction and loss of life. In all, 85 lives were lost and over 300 people were injured. Though the majority of the victims were Jewish, there were many other people involved as well since the community center was situated in a highly developed part of the city. In addition to being a disaster by the hands of terrorism, the bombing was a catalyst for one of the worst regressions in the battle for human rights in Argentina. Not only was the attack targeting a specific group of people, but nobody has been convicted for the act of terrorism, even 16 years after the catastrophe. The original case held little hope from the very beginning, as there was suspicion of government interference in the judicial investigation. The court accused several officials of constructing a false case that would support their political interests. The corruption culminated on October 31, 1995 when Federal Judge Galeano, the judge who was in charge of the investigation, bribed a suspect. Consequently, the progression of the case was slowed down and the legitimacy of the investigation was put into question. For the most part, the investigation remained inactive for nearly a decade until 2004 when a court acquitted the men who were initially accused of participating in the bombing. The court claimed that the information gathered by Judge Galeano was inadmissible because he tampered with the investigation. For his corruption of the judicial process, Galeano was impeached a year later. However, in 2009 the Supreme Court declared that any information accumulated prior to October 31, 1995 was valid and useful for further investigations. After the cases of the initial suspects were dropped in 2004, there was instant controversy. The Argentine public cried out for judicial stability while the victims and families of the victims of the AMIA bombing demanded justice. After more than two years of cleaning up the mess left by the corrupt law officials, the Argentine judicial system made a significant advancement in the investigation that would enable the case to move forward even more. 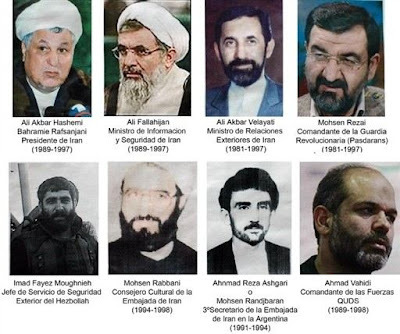 In October of 2006, special prosecutors Alberto Nisman and Marcelo Martínez Burgos formally accused the government of Iran of planning and directing the bombing and accused the Hezbollah of executing the attack. These accusations stimulated increased interest and action in the investigation from the courts. Just one month later, a federal judge issued an international warrant for the arrests of nine former Iranian officials, including the former president Ali Akbar Hashemi-Rafsanjani. The Interpol General Assembly would get involved the following year by issuing six arrest notices. After years of failure of Iranian cooperation, in September of 2009 Argentine President Kirchner stood before the UN General Assembly to request once again that Iran collaborate with the Argentine justice system. However, the government of Iran and the Hezbollah still retain their claims of innocence, even though Israel and the United States have added pressure by also expressing suspicion of Iranian and Hezbollah involvement. Apart from the efforts to convict those Iranian officials and Hezbollah members that were engaged in the AMIA bombing, there were a number of other people that were approached, accused, or arrested for suspicion of having taken part in the attack as well. In June of 2009 a federal judge demanded the arrest of a Colombian citizen that was thought to have coordinated a Hezbollah unit that participated in the bombing. In addition, in October of 2009 a federal judge accused former President Menem, along with several other former government officials, of covering up certain details of the attack, thus obstructing justice in the investigation. Currently, there is strong consideration to investigate Menem along with the officials and judges who are already facing prosecution for corrupting the judicial investigation of the AMIA bombing. Although nobody has officially been convicted for the 1994 AMIA bombing, there is a renewed sense of optimism that the Argentine courts are approaching justice. Although it seems that the corruption within the judicial system has been eradicated, these past obstructions have certainly left its impression. Not only did the interferences stall the investigation for several valuable years, but they also compromised the integrity and credibility of the Argentine courts. Now, in order to regain public trust in the judicial system, the courts must work toward prosecuting the corrupt officials in addition to the criminals of the attack. It has taken well over a decade, but the victims and families of victims of the AMIA bombing can finally anticipate justice in the near future. Though it is evident that in recent years justice and protection has become a higher priority in Argentina, there is still more to be done by the government in order to address these values as human rights. “We hope that renewed efforts will be made to finally bring closure to the AMIA cases, for the sake of the victims’ families, for all of Argentine Jewry and for Argentina[...]"
Esfandiari, Golnaz. "Iran: Argentinian Warrants Urge Rafsanjani's, Ex-Officials' Arrests - Radio Free Europe / Radio Liberty © 2010." Radio Free Europe / Radio Liberty - Free Media in Unfree Societies. 10 Nov. 2006. Web. 19 July 2010. .
Kiernan, Sergio. "A Cover-Up Exposed:The 1994 AMIA Bombing Case Hits the Wall-American Jewish Committee." Home-American Jewish Committee. Web. 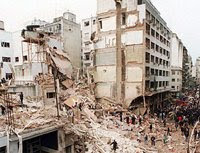 19 July 2010. .
"1994 AMIA Bombing." Wikipedia, the Free Encyclopedia. Web. 19 July 2010. .
"AJC Renews Call for Justice on AMIA Bombing Anniversary-AJC Washington DC Regional Office." Washington Regional Office-AJC Washington DC Regional Office. 16 July 2010. Web. 19 July 2010. .
"Argentina | Human Rights Watch." Home | Human Rights Watch. Web. 19 July 2010. .
"Intelligence and Terrorism Information Center - Special Studies - Intelligence Publications." Intelligence & Terrorism Information Center :: Homepage. Web. 19 July 2010. .